Cebu, the Queen City of the South, is now also a major hub to Air Asia Zest, one of the leading budget airline companies in the Philippines. 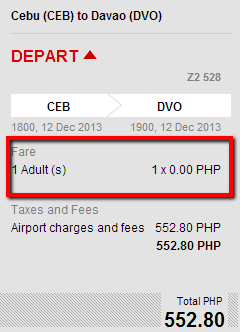 Ongoing now until December 1, 2013, Air Asia will hold a “FREE SEATS” sale or more popularly known as ZERO FARE to their flights going to and from Cebu. Travel period for these Zero Fare tickets starts on December 1, 2013 and will end on March 31, 2104. This is great if you want to participate in the Sinulog Fastival 2014 come January or have an early beach summer vacation in Mactan or Bantayan Island. Domestic Tickets for these Zero Fare promo that includes fees and taxes like the Base fare, Fuel Surcharge, Aviation Security Fee, Processing and 12% VAT can only cost you more or less 552 Pesos per way. Please sample booking below for a single trip from Cebu to Davao. Book your tickets now before time and tickets runs out. best way to book your tickets is to go online and book at www.airasia.com. They accept credit card payments and over the counter payments. You can settle your bill at any 7-eleven stores, Cebuana Lhuiller and Bayad Center outlets. Like us on Facebook at We LOVE Cebu for other travel related topics and other news coming from Cebu!! !